DEFENDING THE PEN: WOMAN = SUPERHERO! If you haven't guessed, Samantha Bryant is here. 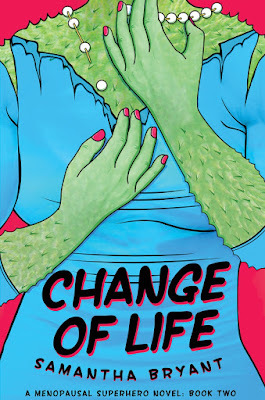 She's agreed to do an interview and share a few of her writing secrets while telling us about her latest release - CHANGE OF LIFE! I’m a lifelong comics and superhero fan. But I’ve been frustrated as an adult woman, finding a hero that I can really connect with. The idea started as a lark, riffing on the idea that if hormones cause superpowers, then menopausal women should have the corner on the market. But the more I wrote, the more I was trying to explore my beloved superhero universe through the eyes of grown women with grown women’s responsibilities. The thing I love about speculative fiction in general is the way you can write about the things that matter most without seeming to. Sure, I’m writing about women who can fly, throw cars, and wield fire. But I’m also writing about the roles of women in society, friendship among women, and the hard choices people make in extreme situations. You can learn through play. 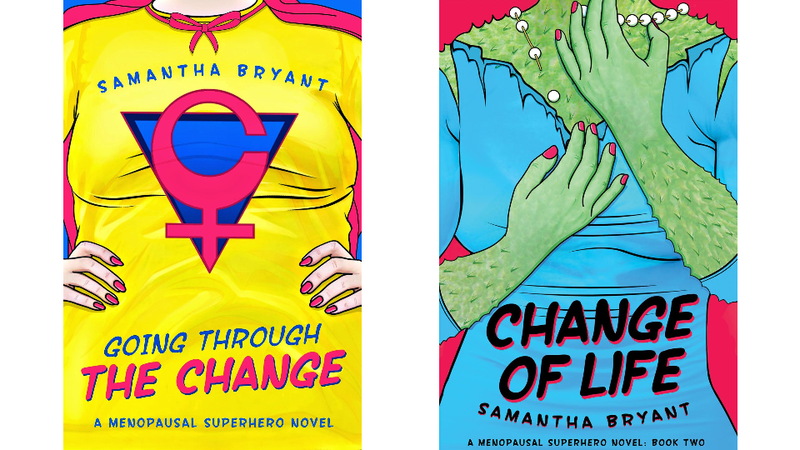 The unusual thing about my Menopausal Superhero series, is of course, menopause. It’s rare in superhero stories to find a female hero over thirty years old, with history, family, and responsibilities. That’s what appealed to me: exploring how a superhero story would be different if the heroes were a different class of citizen than you usually see. So, Going Through the Change and Change of Life, the first two books in this series, center around four heroines and one mad scientist, each going through menopause. 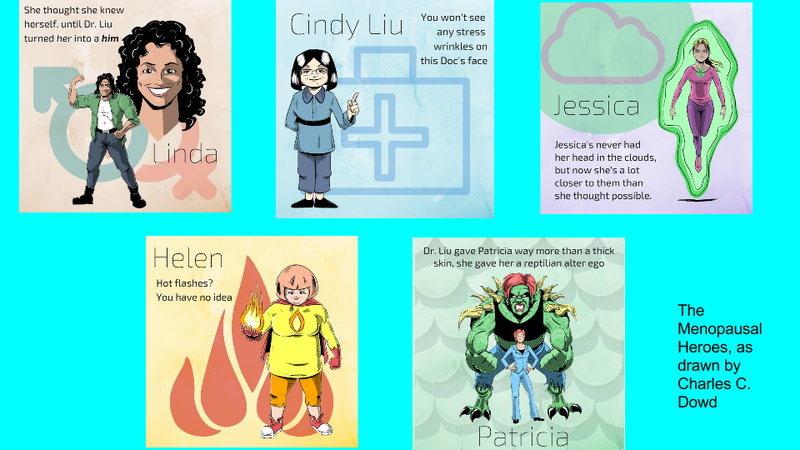 The women range in age from 32 to 67, and come from different walks of life, none of which are typical in superhero fiction. · Jessica Roark is a stay-at-home mother of young children in an affluent suburban neighbourhood. · Linda Alvarez is a 48 year old grandmother and empty-nester living in an older part of the city, with a close-knit neighbourhood. · Helen Braeburn, who lives in an older condo she got on a great resale and that she plans to flip, is a 63 year old embittered divorcée with a grown, but estranged daughter. · Patricia O’Neill is a 58 year old corporate vice president who never married, nor ever wanted to and would break out in hives at the suggestion that she have children. · Cindy Liu is a 67 year old retiree, a famed researcher who feels pushed aside in an industry that values youth above all. The love of her life died young, and she never loved again after that. Ideas seem to sneak up on me slowly. Over time, I’ll notice that I keep coming back to some musing in my quiet moments (which are mostly in the shower or in my car—I don’t get much “quiet” in my day to day life). There’s usually not a lightning flash and a mad science cackle (though there was for the first Menopausal Superhero novel). It’s more like some thought is rolling around in my brain at a subconscious level, growing bigger and bigger and gathering strength and size until, finally, it’s at a conscious level and big enough to do something with. I keep a semi-daily journal where I write down such things (and kvetch about my life), but I don’t keep a writer’s notebook in particular. By the time I realize that that little “bug in my ear” feeling is a bona fide idea, I’m already writing it. This series did have a lightning moment, though, springing from a conversation with my husband. If I’d been pondering this at a subconscious level, it was so subconscious that I didn’t know it. There’s a lot of variety in research time for me depending on what I’m writing. One of my still-in-progress projects is a women’s historical fiction trilogy. I’ve been reading a lot of history books in preparation for finishing that, so the research period is pretty long—already having lasted three years. It’ll probably continue quite a bit longer since I am woefully undereducated about the period between WWI and WWII in the Midwestern United States and historical accuracy will matter and will constrain the story possibilities. But to write stories in my Menopausal Superhero series, there’s not a lot of research before I sit down to write. I’m writing in contemporary time, in a near-realistic world. I research small things when questions come up, like the science of balloon flight, the cellular effects of cancer, the limits of heat proof glass, and elements of traditional Chinese medicine. But that’s more like “quick google search” kind of research, a few minutes at a time. The hard part for me is not to fall into a research rabbit hole and wander around there so long I don’t get back to the actual writing! I can get fascinated easily and get lost. In writing Jessica’s flight ability, I did a lot of research about the mechanics of flight. Eventually, I decided to have her body work on principles of buoyancy like a balloon, rather than thrust and lift like a bird. I loved the idea that Dr. Liu’s experimentation caused a chemical reaction inside Jessica that basically fills her with something lighter than air. It definitely made it fun to write her discovery of her powers and initial difficulties. It gave me some comedic possibilities. 4. Did you self-publish or have a publisher? Would you recommend self-publishing and building an audience before approaching a publisher? What's the best way to build an audience before publication? I’m a hybrid author now, with one self-published anthology out there produced with my critique group, and other anthologies and my novels produced through small independent presses. Every writer I know seems to have a different path, and there are advantages and disadvantages of all of them. My guess is that, eventually, we’re all going to be hybrid authors, choosing the best path for each thing we write, rather than choosing one particular method of putting our work out there. It’s hard to build an audience before publication, but building some kind of web presence is a good start: blogging, tweeting, etc. I’ve seen some writers build a following, at least among other writers, by sharing their process as they work on completing their books and publishing them. That’s getting harder to do now, though, as they are so many writers talking only to other writers and missing out on connecting with readers. But I would definitely suggest developing some kind of web presence, so you’re not limited to only readers and friends in your immediate geographic vicinity. For me, I’d long played on Google Plus and Twitter and had been blogging regularly for a few years before my first book came out. Blogging in particular had been good for me in terms of developing discipline and networking with other writers. That meant that when Going Through the Change came out, there was a small ready-made audience of people who were already interested in me and what I do. It didn’t make me an “overnight success,” but it did give me a leg up, compared to someone who never participated in that world before having something to sell. It gave me people to reach out to when I wanted a signal boost for a release. It’s a reciprocal game, social media love. You have to give to get. 5. Does writing provide you a sufficient income to live on? If so, how long did it take before this happened? Is it your goal to be financially successful, or do you write and publish solely for the 'satisfaction of sharing your stories'? Not yet, though it did let me be generous with my family for winter holidays last year. My first book just came out in April 2015 and I’ve only released one more since. So, I’m a babe in the woods in this game: just over one year in. From what I hear, you need at least five books to make anything resembling a professional salary regularly, and at my current rate of production, that will take another three years at least. It is my eventual goal to be only a writer. Currently, I’m a teacher and a writer and find that it leaves me with a divided heart too often, or feeling like I might be drawn and quartered because parts of me are being tugged in opposite directions. Still, I’m happy to be living my dream even within the constraints of still holding a day job. I feel out of balance when I don’t get to write, like a part of me is missing. While I don’t write “for the money,” I do still want an audience. Unlike my yoga practice, which nobody wants to see, my writing practice is about creating art for an audience besides myself. One of the best feelings in the world is when a reader with no real-life connection to me finds my books and praises them. That’s when I feel like a real writer. Samantha Bryant is a middle school Spanish teacher by day and a mom and novelist by night. That makes her a superhero all the time. 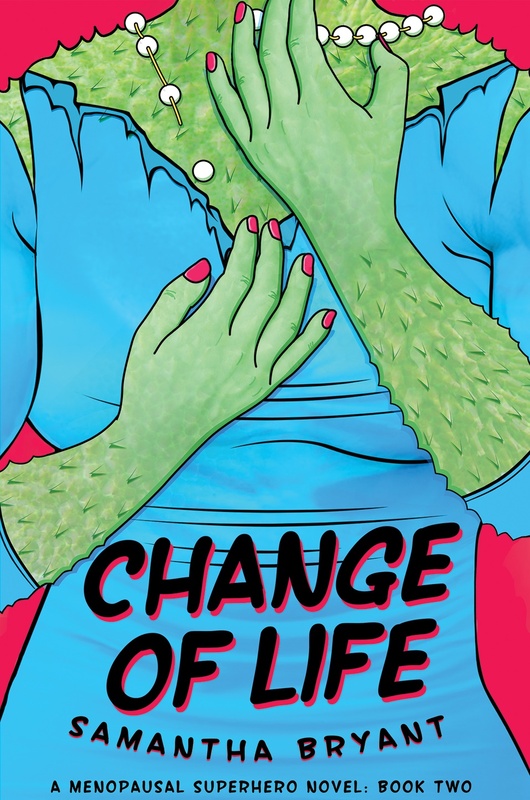 Her debut novel, Going Through the Change: A Menopausal Superhero Novel is now for sale by Curiosity Quills, as is the sequel, Change of LIfe. You can find her online on her blog, Twitter, on Facebook, on Amazon, on Goodreads, on the Curiosity Quills page, or on Google+. I love your premise and I agree Woman = Superhero. Samantha, I love that you write about woman who are older and give them these super powers. Every time you see a super heroine she's about 25, perfect built and no worries. I believe in fantasy, but I'd like a little reality with it. :) Thanks for giving us super heroine with a touch of reality. Thanks so much! I wasn't perfectly built and without worries when I was 25, so I've been a long time looking for superheroines I could connect with. They say write what you want to read and you did! I admire anyone who can do it with a family on top of a job and other responsibilities. Hope you get to be full time author soon. Thanks, Alex! It's a reachable dream, I think. Now that is a neat idea indeed. Very true too, you can't just build an audience of other authors, need readers too. That's the hard part. 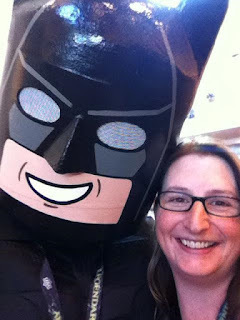 Connecting with other writers is easier, and "talking shop" is fun. But readers don't always want to know about your process. What a hoot! I can totally relate to this one, and you couldn't have chosen a more perfect cover. Thanks! CQ did hire a very talented cover artist for me. Polina Sapershteyn. She did my first cover, too. What a great idea! After all, in more "primitive" cultures, it was the post menopausal women who were the wise ones. Perhaps we all need a little less "civilization" in our lives. Love it! Forget all that youth and its ignorance. Wisdom is where the power is at. LOL. I'm sure you were. I know I am . . .right? Great to see older women as MC's and the topic of menopause getting a mention, still a taboo in many parts of the world. Best wishes for achieving full-time author status soon. When I'm at book fairs and such, some people make such a face when they read the subtitle. It's really quite funny! Yes, how great to see someone over 30 as a hero. That's fabulous. Women are superheroes anyway. Such powerful people. Go us! This is such an awesome idea for a series! I agree with the others - absolutely LOVE seeing women over 30 as the main characters. So great to "meet" you, Samantha. Best of luck meeting that full time author goal!! What a fascinating insight and terrific interview. Well done, Samantha, for getting away from might be perceived as the usual stereotypes when it comes to female superheroes. I suspected my elderly female neighbour had superpowers! It may well be true. Awesome stuff, Samantha. Thank you, Yolanda. Isn't it great when you come with an idea that seems silly at first glance, and then the more you think about it, the more excited you become? Good luck with your series. Cindy Liu sounds a lot like me. That's a little too close for comfort. But I love the super-hero concept. I've read posts about Linda and have seen Changes of Life, but I never actually knew about this series. Menopausal Superhero series? OHMIGOSH! I need these books! My superpower? The power to read minds and then influence them. Could be bad, could be good. Just depends on the way hormones are blowing. Hybrid author. I love that term. I loved this interview and connect with Samantha on a lot of levels. I'm so glad that she broke out of the mold and wrote what she really believed in. Too many authors follow the pack and think that they'll achieve success first and *then* write what they want. Older women in particular have more to offer. We've lived through a lot and understand human nature so much better than the younger crowd. Wishing Samantha much success! !